On the necessity to change the location of the fan zone and the FIFA Fan Fest of the World Cup 2018 and moving it from the Vorobyovy Gory (Vorobyovy hills) to another place. It is known from numerous sources (the official website of the FIFA, publications in mass media, commentaries of the official representatives, the documentation of tender of 7th March 2018 №0173200023318000015 on the website of the state purchases) that the only fan zone for the FIFA Fan Festival of the World Cup 2018 is planned to be located on the Vorobyovy Gory (Vorobyovy hills), which means on the territory of the Ramenki district. The fan zone for the FIFA Fan Festival of the World Cup 2018 is a place where almost every day from the 14th of June till the 15th of July from morning till late night thousands of fans will be present. Also in this place in accordance with the FIFA requirements, the sale of alcohol drinks (beer) will be organized, the television screens and the powerful sound-detecting equipment will be installed. The deputy council of the Moscow municipal district Ramenki declares that when the decision about the location of the fan zone and the FIFA Fan Festival of the World Cup 2018 was made by the authorities Moscow the opinion and the interests of the residents of the Ramenki district were not considered. According to the current plans (the documentation of tender of the 7th of March 2018 №0173200023318000015 on the website of the state purchases), the placing the fan zone on the Vorobyovy Gory (Vorobyovy hills) will cause the blocking of the part of the University avenue (Universitetski prospect) for at least a whole month. It is also known that the Moscow State University Lomonosov administration is planning to block the Mendeleevskaya street and the Lebedeva street for all the transport (except for the university employees’ transport). All these measures will complicate the transport situation in the Ramenki district, which is unjustified. According to current project the placing of the fan zone and the FIFA Fan Festival is planned to be on the territory of the object of cultural heritage — “Park of the MSU Lomonosov on Vorobyovy gory” and also right next to the wildlife preserve “Vorobyovy Gory”, the Bolshoi Gazon MSU park and other green areas. The everyday presence of the thousands of fans will have destructive effects on the unique nature of the Vorobyovy Gory (Vorobyovy hills). Placing the fan zone and the FIFA Fan Festival right next to the Main Building of the MSU will cause serious and unjustified inconveniences both for 500 residents of the apartments of the sectors K, L, I, M of this building and for more than 5 thousand residents (students and PhD students) of the dormitories of the sectors B, V, G, D, E, Zh. The implementation of the current project of the fan zone will complicate seriously the life of the Moscow State University during the summer exam session, which according to the MSU President V.A. Sadovnichy’s order N63 of 21st of February 2018 will take place “in traditional time-frame” (that is till the end of June), and during the entrance campaign in July. It is clear now that the current project of the fan zone has already caused the unprecedented social tension in MSU and is considered unacceptable by the most part of the students and employees of the University. In case of placing the fan zone and the FIFA Fan Festival on Vorobyovy gory (Vorobyovy hills) the territory of the former will become almost inaccessible for walks, sports exercises and recreation both for the residents of the Ramenki district and for the residents of other districts of Moscow. Furthermore, this situation will become even worse because of the closing of the University territory for those who are not MSU students or employees, as it is promised by the MSU administration. The biggest international football competitions are regularly accompanied by the collisions of fans and mass riots. In case of such collisions and riots in the fan zone and the FIFA Fan Festival on the Vorobyovy Gory or on the way to it, the police and other law forces will have difficulties to localize them because of the significant amount of the green territories and parks. In this case, the apartment houses of the Ramenki district situated along the Mosfilmovskaya street and next to the metro station Lomonosovski prospect will be threatened. The current project of the placing of the fan zone and the FIFA Fan Festival is obviously not convenient for the fans either. First, because of its remoteness from the most of the hotels recommended by the official website of the Organizing Committee “Russia-2018” welcome2018.com. Second, because of the logistical difficulties: the remoteness of the territory from the main lines of public transport. The deputy council of the municipal district Ramenki calls to the President of the Russian Federation V.V. Putin, to the mayor of Moscow S.S. Sobyanin, to the FIFA President G. Infantino to do everything that is possible to find at breakneck speed a new, more appropriate location in Moscow for the fan zone and the FIFA Fan Festival of the World Cup 2018 and to reject the project of placing it on Vorobyovy Gory (Vorobyovy hills). 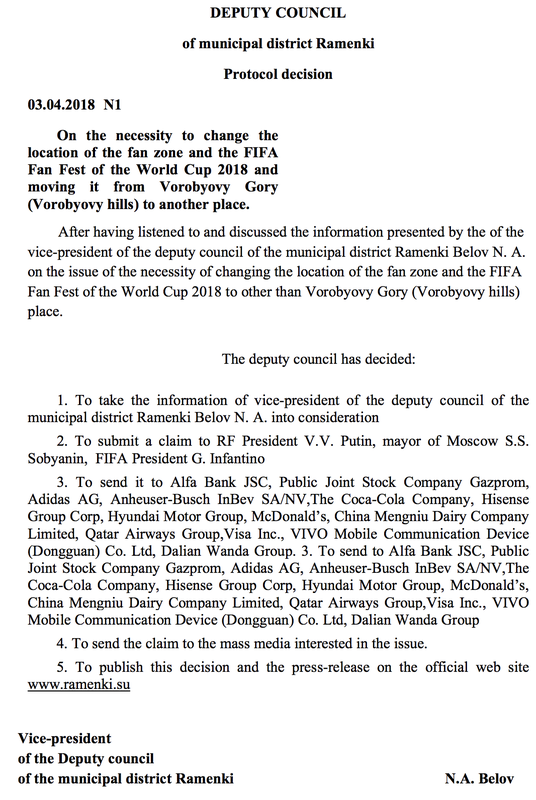 The deputy council calls to the FIFA sponsors and to the sponsors of the FIFA World Cup 2018 and asks them to use their influence for the defence of the unique nature of the Ramenki district and the interests of its residents.